In his 30 years as state archivist, Gregory Sanford has moved from a windowless cubicle in the basement of a Vermont state office building in Montpelier to a modern office attached to a warehouse full of documents six miles away in Middlesex. People looking for those records often don’t have to pull yellowing bound volumes off the shelves anymore, but can find what they’re looking for online, thanks to an ambitious effort headed by Sanford to make the records easily accessible to the public. "I spent almost all my career saying, ‘OK, how do I fold this back into our public dialogues, get it to reporters, get it to legislators, get it to public officials.’ And not just simply, ‘Isn’t that nice? Ye old government, whatever," said the 65-year-old Marshfield resident. From his arrival in 1982 to four years ago, Sanford worked to get the new archive system up and running. "Now that it’s created and launched, it’s really time for me to go," he said in announcing Tuesday that he is retiring Aug. 1. Sanford said an archives available to the public can "provide context to help decision making. (It) doesn’t tell you what to do, but it sort of suggests how you got here from there." Want to shed some historical light on the push by Gov. Peter Shumlin and lawmakers for universal health coverage in the state? Sanford has his fingertips on materials about legislative debates from 1931 about improving health care for the poor and from 1944 about "socialized medicine." Hot current issues ranging from childhood immunizations to raising taxes for schools can be informed by a visit to the headquarters of the Vermont State Archives and Records Administration – or to its website. During the 1910s, a debate raged about whether consumers had a right to know if their food had been sprayed with pesticides. Sanford said that could have informed this year’s debate that ended with lawmakers not acting on legislation calling for labeling of genetically modified foods. "You look across time and say, ‘OK, we’ve debated these issues,’" Sanford said. Sanford got a degree in history from Washington College in Maryland and was visiting friends in North Fayston in 1971 when he "really became enamored of Vermont and Vermonters and the human scale of it all," he said. He enrolled in graduate school at the University of Vermont and worked on an oral history project under the highly regarded Vermont historian Samuel Hand – the subject was the career of former governor and U.S. Sen. George Aiken. Later, Sanford got another assignment – this one handed down from then-Gov. Richard Snelling. Preparing his first inaugural address, Snelling read those of his predecessors, then suggested they be gathered in a book, a project that proved too expensive to pull off, Sanford said. Working on that project, Sanford met Paul Gillies a member of Snelling’s staff, who would go on to serve as deputy to former Secretary of State (and later governor) Jim Douglas. With a recommendation from Gillies, Douglas hired Sanford in 1982 to be editor of the Vermont state papers, a job title that later shifted to state archivist. Sanford devoted much of his career to raising the profile of the state archives, a project that culminated in 2008 when the archives were merged with the Division of Public Records and moved to the new headquarters in Middlesex. There was another project as well: That collection of governors’ inaugurals that proved too expensive to publish as a book now is available online. "It’s sort of a nice arc of a career," Sanford said. "It would have cost too much in the paper world … but then, decades later, we did it. They’re online and they’re full-text searchable." 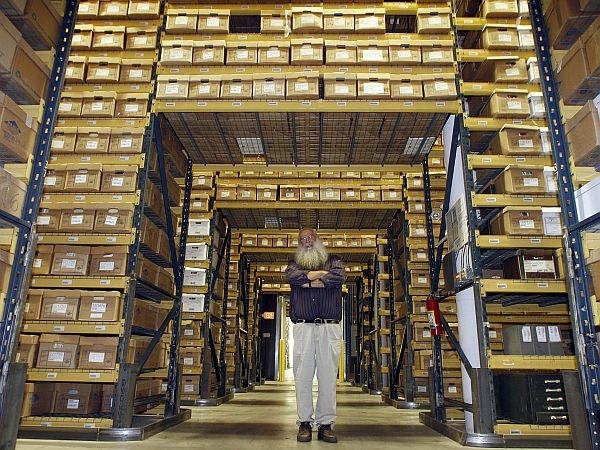 While the artifacts in the Vermont State Archives are under lock and key, the secrets they contain are also stored in the brain of Gregory Sanford, who has been the official state archivist for the last 30 years and is retiring this summer. Vermont is getting a big boost from the federal government as the state strengthens the way it manages court records. Archive officials say the court paperwork will be better organized and more accessible, and they expect that to help genealogists, historians and legal researchers.